Marie Gadbois and her proud parents, Karen and Charlie Gadbois, take a break from celebrating to pose for a picture. After over six years at Algonquin, Gadbois graduated on her 22nd birthday on January 17. 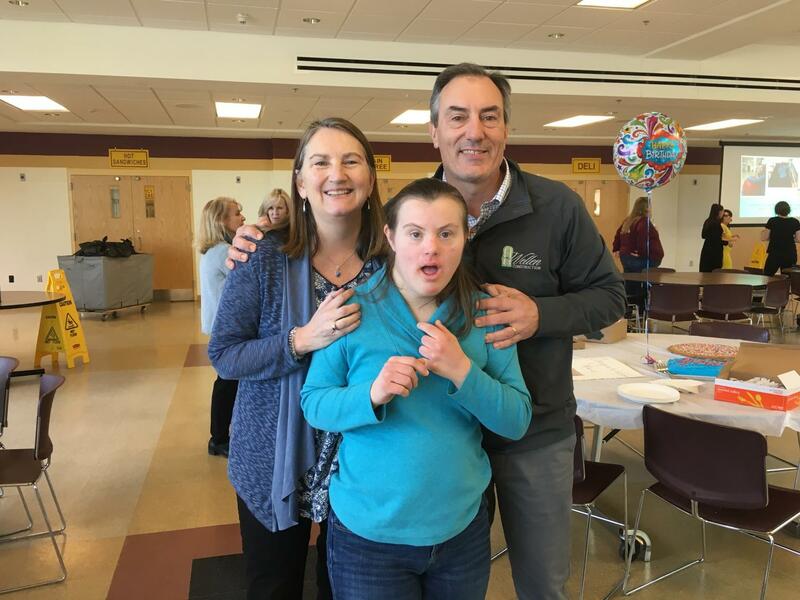 Surrounded by friends and family, postgraduate Marie Gadbois celebrated her 22nd birthday and graduation from the special education department’s Community Access Program [CAP] on Thursday, January 17 in the cafeteria. Hynes has taught Gadbois for nearly ten years. She has seen first-hand the positive impact Gadbois has had on the school during her time at Algonquin. According to her parents, Karen and Charlie Gadbois, Marie Gadbois also participates in some women’s groups and youth groups. Her favorite activity of all is going to the beach, according to Charlie Godbois. Although Gadbois is very busy with extracurriculars, her personality is what sticks out the most to the people who know her. Gadbois said she was very excited to be celebrating her birthday and graduation with her teachers, friends and parents. After graduating, Marie Gadbois plans to attend a program in Ashland called Advocates where she will do volunteer work in the community and continue to learn life skills. Hi Maggie – I wanted to let you know what a great job you did presenting this article! Thank you! You did lovely job capturing this occasion and Marie’s spirit.